I've updated this gallery with an additional 246 images of Caroline and the Anderson Trojan Marching Band from their Senior Night game against Bowie H. S. at House Park. They follow the previous posting of the UIL Regional Competition. The captions contain the filenames. UIL Region 18 Marching Band Contest - Toney Burger Center, Austin - Anderson High School's Color Guard Captain, Caroline Beneke. My Mom and I got to talking to Caroline's Mom, Debbie, during the competition. 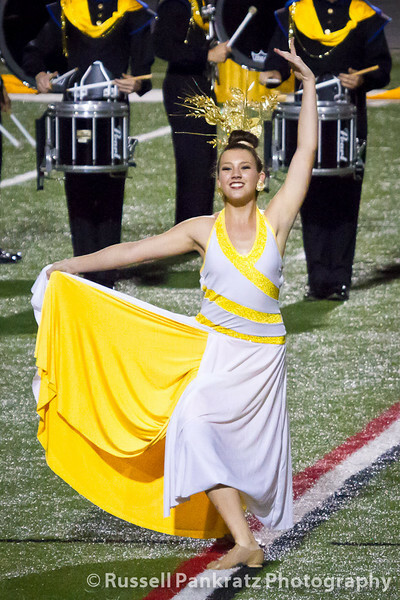 When Anderson's Band took the field, Debbie pointed out her daughter, and I started shooting. I've admired Anderson's performances all year, and they received a One rating again this evening. My focus was Caroline's performance. You have my permission to download and use these images on social media sites and share them with family and friends. Please leave my watermark visible and mention this site: rppix.smugmug.com. Q: How do I download the best Image? A: 1) Page through the images using your keyboard's arrow keys, don't try to mouse click those teensy arrows above the images. 2) Hover your cursor over the large image on the right half of this webpage, you'll see a menu popup. In the list of "View Size," choose "Original." After the image finishes loading, Windows users right-click the image and choose "Save file as..." to save to your hard drive. Mac users' machines are so intuitive that I don't have to tell you how to download images (I don't use Mac's -- I have no clue how to download an image :^p). I can print photos for you too if you'd like for a small fee. Email me at russell_pankratz@yahoo.com. The filename for each image appears as the caption below the image.